It was quite an excited crowd at Space Center Rotary when President Nancy Anderson presented a check for $20,000 to the Clear Creek Education Foundation for The Leader in Me program at Space Center Intermediate School. Among those taking part in the ceremony were, from left, banker Jim Stewart, realtor Jonathan Cottrell, Rotarians Bob Wren and Nancy Anderson, CCEF President Deborah Laine, Space Center Intermediate student leader Eden Fuentes, and Principal Ann Thorn, Clear Creek ISD Superintendent Dr. Greg Smith with Deputy Superintendent Paul McLarty, both Rotarians, and Dr. Karen Engle, assistant superintendent of secondary education. 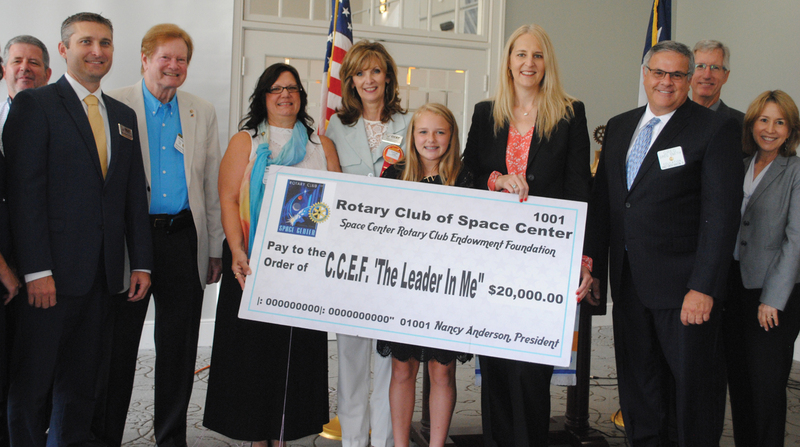 In an effort to take education of students in the Clear Creek schools a step higher, Space Center Rotary Club is donating $60,000 over the next three years to the Clear Creek Education Foundation, which is overseeing a highly touted program called The Leader in Me. The program was initially started locally two years ago at Falcon Pass Elementary in Clear Lake with a $50,000 CCEF grant. 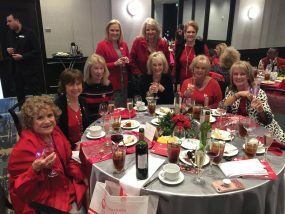 With the Rotary dollars, CCEF will now oversee a similar program at nearby Space Center Intermediate, Rotary Club President Nancy Anderson announced at the Aug. 27 club luncheon at Bay Oaks Country Club. 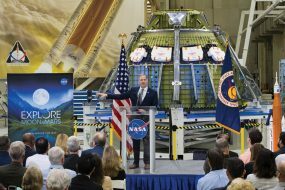 Others taking part in the ceremony were Space Center Intermediate Principal Ann Thorn, student leader Eden Fuentes, who went through the program at Falcon Pass, CCEF President Deborah Laine and a number of CCEF Board members. Over 3,000 Leader in Me Schools in 50 countries are embracing this new paradigm and discovering answers to the most challenging issues that educators face today. The City of Webster plans to sponsor the program at McWhirter Elementary there and Seabrook Rotary is looking into sponsoring Leader in Me at Bay Elementary in Seabrook. 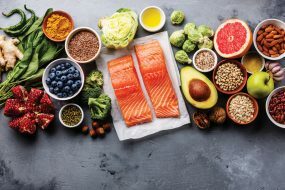 Falcon Pass Coach Rachel Holcomb thinks the program helps educators empower their students to become “game changers” in their education, health, community and in their relationships with others. “It’s about kids recognizing that everyone has something to bring to the table and their potential is endless,” she added. Space Center Rotary already sponsors the Early Act First Knight program at Whitcomb Elementary to help young children learn high ethical standards — honesty, discipline, responsibility, tolerance, confidence, perseverance and compassion.